If you’re looking to build strength and try something new, book onto our upcoming Arm Balance Playshop. The workshop will explore firm foundations through wrist and scapular strength, followed by working into Crow (Bakasana), Side Crow (Parsva Bakasana) and finally having a go at Sage Koundinya I. 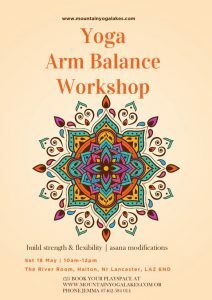 The workshop will offer modifications into the poses and give you the time needed to explore the asana, which you might not have time for during your regular practice. Visit www.mountainyogalakes.com or call Jemma on 07462 584 014 to book on or discuss further.